We are suppliers of fresh and frozen meat and meat products. We are based on the South Coast but supply a full range of clients all over the UK. 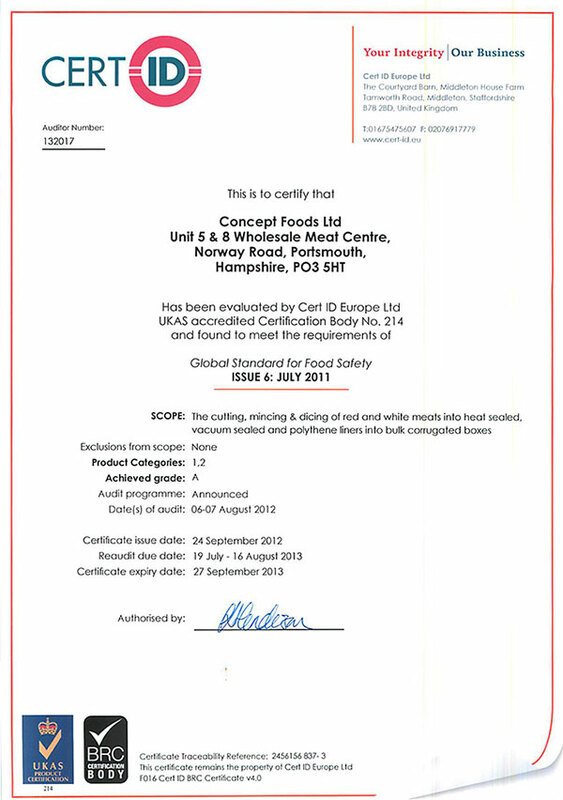 We operate a full throughput cutting plant (UK 6219), licensed and inspected by the Food Standards Agency. We are BRC ‘A’ Grade. We operate from a purpose built cutting room, as well as having our own cold store. Our distribution service offers nationwide delivery. Holding client's stock enables us to deliver anywhere within 48 hours on demand. We apply HACCP principles to all our production, this includes metal detection (ferrous 1.5mm, non-ferrous & stainless 2.5mm). Routine hygiene checks are carried out by Intertek Food and Agri Ltd. Current testing regime includes: fat analysis, microbial counts, surface swab tests and DNA testing to confirm product contents. Our clients include ready meals manufacturers, schools, universities, catering and the food service. We pack for others under their own label, as well as supplying under the Concept brand. Concept Foods was established in 1999 by Nick Dunn (Managing Director), Nick King (Production Director), and Neil Carter (Company Secretary); a combination with over 75 years experience in the meat trade. Norway Road, Portsmouth, Hampshire, PO3 5HT.